One of the most important aspects of designing and building any part of a vehicle electrical system is determining the correct size and type of cable to use for each circuit. Too small a cable size and you'll run the risk of generating heat in the cable; too large and you'll be wasting money on copper you don't need. Also, what sort should you use - plain copper or tinned, standard PVC insulation or thinwall insulation? The following article should give you an insight into how electrical cable is specified and allow to you choose the right one for your application. You will have noticed that cable used in vehicle electrical systems is very flexible in contrast to the cable you would find in the the walls of your home, which is fairly stiff. The reason for this is that copper, although quite ductile, is susceptible to 'work hardening' when subject to vibration and mechanical shock, such as is experienced when installed in a vehicle. This work hardening causes the metal to become more brittle which could, over a long period of time, cause a stiff, solid conductor to crack and fail. Tip: Be careful when stripping the insulation from a stranded cable that you don't accidentally remove any of the copper strands. This will reduce the total cross-sectional area of the conductor at that point and consequently also reduce the current carrying capacity of the cable. The same applies when crimping the conductor to a terminal - make sure all strands are contained within the crimp or the current carrying capacity will be reduced. Cross sectional area of the conductor Expressed in mm² and describes the total cross sectional area of the copper conductor. You will sometimes see cable described as 1mm or 2mm cable without the ² sign but it is important to note that this does not mean the diameter of the cable. This can often lead to confusion so just remember that the main specification for a cable will be its conductor's cross-sectional area and cable will never be referred to by its diameter alone. Nominal current rating Expressed in Amperes (Amps or A) and is the maximum continuous or 'working' current that the cable can safely carry. Overall diameter This is the diameter including the insulation and usually expressed in mm. Additional specifications may include a working temperature range and resistance to certain chemicals such as acids, fuels, oils etc. Each component or appliance connected to a circuit will have a current draw associated with its operation and it is important that the cable supplying power to these is capable of carrying the normally expected current, plus a margin of safety. If it is not capable then it is likely to result in the cable becoming hot and potentially catching fire. Although fuses are used in the circuit to protect the cable, the cable itself should be of an adequate rating to prevent this over-heating occurring under normal circumstances. If we wanted to wire up a light that we know has a power rating of 50W, then using I = P/V the current draw would be 50W/12V = 4.17A. This tells you that you could use a cable with a rating of 4.17A or above, however it is good practice not to design a circuit operating at the upper end of the cable's rating and so you should select a cable with some additional capacity. In this case 0.5mm² (11A) cable would be appropriate. All elements of an electrical circuit have resistance, including electrical cable, which means that there will be energy loss in the form of voltage drop experienced along the length of the cable. Just as a bulb converts electrical energy into heat and light due to its resistance, and so induces a voltage drop, a copper conductor has resistance and will convert some of the energy it conducts, causing a voltage drop in the same way. The difference is that voltage drop across a bulb (or other load) is great as that's what makes it work, but voltage drop along cable and other passive parts of a circuit is not desirable as it's not a useful conversion of energy. In low voltage systems cable length can have a significant impact on voltage drop. Even a cable run of a few metres for small cross-section conductors can produce significant voltage drops and this problem is demonstrated well on some vehicles where the headlights are not as bright as they could be. If you check the voltage at the bulb connectors you might find that the bulbs are not receiving a full 12V from the circuit due to the conductor size being too small for the cable run length. Some owners opt to improve their headlight circuit by using cable with a larger conductor over a shorter distance which allows the circuit to provide full supply voltage to the bulbs, often with very significant improvements in lighting. So we want to select a cable to make sure that the voltage drop is not so large that it will cause problems, but what is acceptable and how do we calculate the right cable size to use? Well the generally acceptable voltage drop for DC circuits is around 3% and we can use V = IR (see Electrical Circuit Basics ) to calculate the voltage drop for a cable if we know the current draw of the load and the cable's resistance per metre. This shows that although 0.5mm² cable is OK for the expected current draw of the light, it's not OK for the cable run length as the drop is greater than 3%. So what about 1.5mm2 cable with a resistance of 0.0127W/m ? There is a general rule of thumb that says if you're unsure whether the cable is large enough for the job, go up a size. This is a bit crude and not very scientific but it's not a bad rule to apply as increasing cable size can't do any harm. Anyway, enough maths - to make it easy we've developed this handy calculator which will show you the approximate voltage drop based on cable size, supply voltage, current draw and cable length. It is important to note that voltage drop occurs not only along the positive cable to the load but also along the negative return cable. When you enter the cable length as the 'one-way' distance to the load the calculator assumes (for simplification) that the return distance is identical, giving you a total cable length which is twice that of your entered value. In practice your return cable length might be much shorter as it will probably be grounded to a nearby point on the chassis, so the remainder of the distance back to the battery negative should have an extremely low resistance relative to a cable. In this case the actual voltage drop would probably be less than calculated, but it provides a 'worst case' figure to work with. Voltage drop can also be caused by high temperatures, although to a lesser degree than cable length, because as temperature increases, resistance increases and vice versa. In high voltage systems voltage drop is not such an issue which is one of the reasons that electricity is carried across many miles at up to 400 kV. The other reason is that the same power can be delivered at a higher voltage but with a lower current, meaning that smaller sized, less expensive cable can be used. Thin wall refers to the relatively reduced wall thickness of the insulation compared with that of standard PVC insulation. The insulation in thin wall cable is a harder grade of PVC with better electrical insulation properties for a given thickness and has several advantages over standard PVC cable. Firstly it is lighter, meaning that there can be significant weight savings in large wiring harnesses and this is one the main drivers behind it having now been adopted by almost all vehicle manufacturers for their electrical systems. Secondly, it has a greater working temperature range with a maximum of around 105ºC compared with around 70ºC for standard PVC. This makes it more suited to use in areas close to the engine. Thirdly the harder grade of PVC is more reistant to abrasion and cutting than standard PVC, offering more protection and greater reliability. The one drawback of thin wall cable is that the insulation is less flexible than standard PVC. This is generally not an issue with smaller sized cable but for larger sizes such as battery cable the standard PVC insulation might be preferable if, for example, the cable routing involves tight bends. 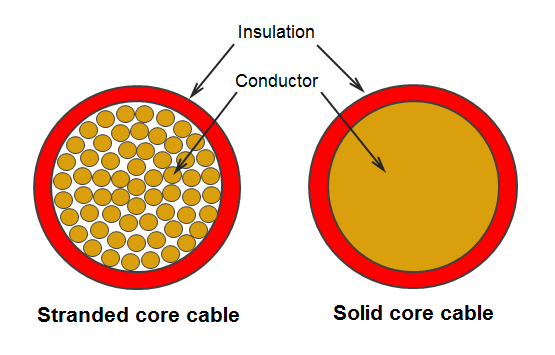 The core of most cable is made of plain copper which, although an excellent electrical conductor, will oxidise over time if exposed to moisture. This copper oxide layer is usually seen as a brown/black discolouration and if it reacts with acids then it can form verdigris which appears as a greenish-blue layer. This oxidisation can degrade the performance of the conductor by causing increased resistance and poor electrical contact, and where moisture has wicked up the strands of the cable by capillary action it can often mean cutting away a significant length to find shiny copper again. In most situations the detrimental effects can be minimised by using shrink sleeving, sealed connectors, adhesive lined terminals, protective gels etc. to keep moisture out, but in some applications where the environment is particularly aggressive, for example marine use, it might be preferable to use cable with tinned conductors. This is simply where the standard plain copper conductor has has a layer of tin applied before being sheathed in the insulation. Tin doesn't react in the presence of moisture, yet retains good conductivity, and so improves long-term performance of the cable. The downsides are that it is slightly more expensive and there is a more limited range of sizes and colours available compared with plain copper. Earth braid straps that have no insulating layer are typically tinned for protection as a matter of course. Where cable is to be used in aggressive environments where it is subject to extremes of temperature and mechanical wear, double insulated cable might be appropriate. This cable often utilises tinned copper conductors with a thin inner insulation and a thicker, often rubber, outside insulation layer to protect the conductor. This type of cable is typically used in agricultural machinery or heavy plant machinery where these harsh environments frequently occur, and is not typically found in passenger or light commercial vehicles. It has sufficient current rating for the expected load in the circuit, including a margin of safety. Get these right and you can be confident that your cable is right for the job! In Europe, metric sizes are used for stranded cable and are expressed as the total cross sectional area of the conductors together with the number of strands and their diameter. For example, a cable specified as 2.0mm² 28/0.30 indicates that it has a total conductor cross sectional area of 2.0mm² and is made up of 28 individual strands, each of 0.3mm diameter. In North America the AWG standard is most commonly used for stranded cable and expresses the Gauge together with the number of strands and their Gauge. For example, a cable specified as 16 AWG 7/24 has a size of 16AWG and is made up of 7 individual strands, each of 24 AWG. The table below provides a cross-reference between these two standards, showing the closest metric equivalents to each Gauge for cable sizes commonly used in low voltage automotive and marine applications.